Block one or more resources of your web pages during the performance tests to determine their impact on the loading time. Why measure the impact of third parties? Third party resources (widgets, advertising, etc.) are edited and hosted by a third party, so you don't control them. Dareboost allows you to compare the performance of the same page with and without these third party contents, in order to identify the impact of your advertisements on the loading time for example, or to measure quickly the benefits of the deletion of these elements. Dareboost provides an "Adblock" option. 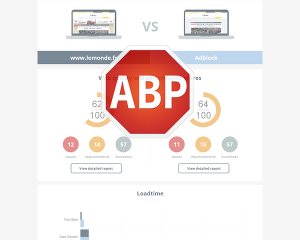 Use the famous ad blocker and launch a performance and quality audit without these contents. We also offer you the ability to specifically block content of your choice by defining a blacklist (block a list of resources) or a whitelist (block all resources except those explicitly allowed).